So how many of you out there follow Patricia Briggs' Alpha and Omega series as well as her Mercy Thompson one? I'm always curious about how many followers the offshoot series get as compared to the flagship ones. This has been on my mind, especially in light of Ilona Andrews' Gunmetal Magic recently making its debut (more to come on that one soon). I was torn at first with the notion of this series, though. First of all, I love the tiny glimpses of Charles we get in Mercy's world. And I was insanely curious about the Marrok's hit man son and how he would fare in his own story. At the same time, no Mercy? No Adam? But potentially more Bran . . . THE EMOTIONS! I have them. So back when the introductory novella first came out, I picked it up in a Barnes & Noble and stood there reading the first pages. Just to see. You understand. Well, I ended up finishing it right there. Standing in the bookstore. I immediately purchased it and began counting down the days until the release of Cry Wolf, the first full-length novel in the series. I was not disappointed, and I enjoyed the next book well enough, though Mercy still held a place of honor in my heart. So I guess I had somewhat moderate expectations for the third book in the series. I was expecting good. But, you guys, I got amazing. Anna hasn't been happy in some time now. She loves her adopted home in Montana. She loves being part of a pack that's positively civilized in comparison to the one she belonged to in Chicago. And she loves her mate. But Charles hasn't been present for months. He's there next to her. He goes through the motions. And he carries out his father's will with an implacable determination. But despite all this, Charles is missing. And Anna has had enough. As an Omega, she alone has the ability to face the Marrok and not cow to his power. But Bran, in all his wisdom, cannot see another way to mete out the necessary justice across the packs of North America without using Charles as his enforcer. Nevertheless, Anna is determined to destroy whatever is haunting Charles and see their bond restored once more. And then Bran sends them on a mission to Boston. Missions are nothing new to Charles. But this one is different. This time Anna is in charge. She will be the face of the Marrok in dealing with the FBI, the fae, and other federal agencies in regards to a string of murders stretching over decades and involving the deaths of wolves, fae, and humans alike. Charles is to be merely the "backup." Both Anna and Bran hope this reprieve will provide some much needed downtime for the Marrok's dreaded Wolfkiller. That, in time, he will begin to heal. Charles let his hand linger on Anna's back. She wore a sweater and a light jacket, but he pretended he could feel the heat of her through the clothing that covered her. Brother Wolf wanted her off this island and somewhere far away from killers who hunted werewolves and left no scent behind for them to discover. But Charles knew better. To try to encase his Anna in Bubble Wrap would be to kill the woman who protected him with her grandmother's marble rolling pin. She was the woman he fell in love with. Then why are you hiding your ghosts from her? Brother Wolf asked. Because I am afraid, Charles answered his brother, as he would have answered no one else. He had lived a very long time, and only since he gained Anna had he learned to fear. He'd discovered that he had never been brave before--just indifferent. She had taught him that to be brave, you have to fear losing something. I am afraid I will lose her. That they will take her from me--or that I will drive her away when she sees what I really am. Beauclaire had addressed that. Charles couldn't remember the fae's exact words, but he felt them. People as old and powerful as he should never be given someone to love. The emotional play at work in this book is complex and riveting and every character shone. More than any of Briggs' other works, this one is a police procedural at heart. The investigation is relentless and filled with the darkest of killers. In fact, this is the darkest book in the series by far. But it is also the most sophisticated, the most compelling, the most rife with emotional payoff, development, and excitement. 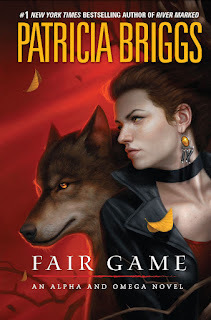 I was shocked at the outcome and almost painfully eager to find out just exactly how Ms. Briggs is going to address the fallout in both the next Alpha and Omega book and the next Mercy Thompson book. I love how the two are intertwined, and I will be knocking on my local bookstore's door the day the next one comes out. Well played, Ms. Briggs. Fair Game is going on my Best of 2012 list no question. Dark Faerie Tales - "What a worthy sequel to an equally worthy series." Dear Author - "I read the bulk of it in one sitting, I've already recommended it to another Briggs fan, and I know I'll end up rereading it while I'm waiting for your next book to come out." The Ranting Dragon - "I couldn't put it down." Rhapsody in Books - "I love the relationship between Anna and Charles." Smexy Books - "I LOVE how Briggs writes her wolves." Oh. *attempts not to fangirl* You, um, you should. You should read Mercy. It's a wonderful series and I can't wait to see what happens next, given the cliff-hanger she left us with the end of Fair Game. Right?! That was a DOOZY. Oh yes, I've definitely been reading--and loving--this offshoot series! I agree, this was a good one! Yay! I was just so happy with the character arcs in this one. They were mature and just very well done, I thought. If I had to choose, I would actually pick this series over Mercy. Luckily, I don't have to choose, I get to read them both. I just wish Patty Briggs was a bit more prolific so we wouldn't have to wait so long between installments. That makes me happy. It deserves to be loved. I know what you mean, too. Waiting is agonizing . . .
Mercy rocks. That's all there is to it. 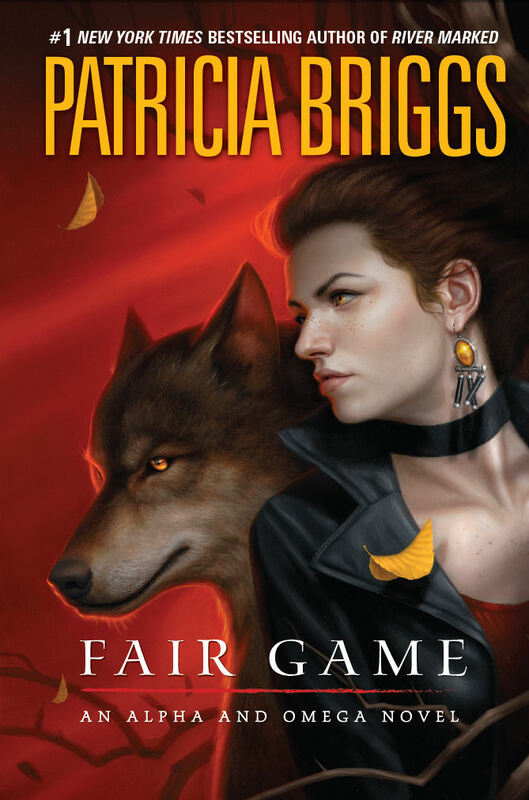 Actually the first time I read Patricia Briggs was Cry Wolf, LOVE IT! then I had to read Alpha and Omega of course, it was incredible, after that I was a gonner, I heard about Mercy and went to read it, but even though I love those books, Charles is my first and only and I wish for more, I guess it's better to wait and have quality than no waiting and have trash, but it's still hard. Ooh, that was a good introduction! I'm rereading CRY WOLF right now, as a matter of fact. Finishing FAIR GAME made me crave going through the series again, and it is so fun! I can't remember if I've read Hunting Ground or not, but I like Cry Wolf. I know I'm a book behind on Mercy. But I'll eventually read them - I love Patricia Briggs. I don't know why my expectations weren't higher, but this book was such a treat. Reminded me why I fell in love with the Mercy series and Briggs' writing in the first place. Just top notch and I LOVE it when that happens in the middle of an established series. Kate's world is unrivaled. I am always so happy to return to it. Hope you enjoy GUNMETAL MAGIC! Let me know. Awesome. I know if I'd read Alpha and Omega first it would have sucked me in for sure. Happily, I was already a professed fan when I gave it a shot. Fabulous. She somehow just nails that relationship and makes the three of them work, especially in this one. I guess I jumped into the Alpha and Omega series without reservation because I loved the premise. Normally I'm wary about an author writing more than one series around the same time. Is one series going to be cobbled together while the "main" series gets all the attention? (That's what I wonder sometimes.) But with Patricia Briggs (and Ilona Andrews for that matter), I didn't have that worry. That's the mark of an excellent writer!!! Yes, that sounds like my usual wariness as well. But you're right about Briggs and Andrews. And this one just really brought that trust home for me. What excellent storytellers they are. The ending was crazy, but good and the implications are HUGE I can’t wait to see where she takes it. I too liked finding out more about the Fae. I love the stories about Charles and Anna. The series just gets better with every book she writes. I can't wait for the next book!